The Un-Official Blog of Romance Author Maddie James: Project Abandoned! No, not my closets project. I actually made very good progress on those today. Mostly because another project I decided to tackle while it was cool, took a turn for the worse in a few short minutes. After that, I was able to work diligently in the house on the closets. This morning, I wanted to trim some wayward branches from a couple of bushes at the side and back of the house. I have three very healthy azalea which have grown tremendously in the past three years, even with pruning. Several spikes needed a snip, so I set out with my trusty wheelbarrow, my pruners and garden gloves, and started whacking away. Before I knew it, project abandoned! Why? 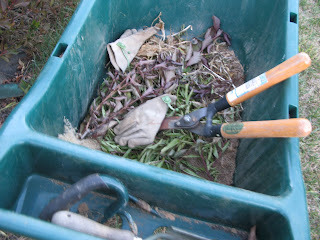 See the gloves tossed haphazardly into the wheelbarrow along with the shears? What you don't see is me dancing around on my patio, batting and swarming flying THINGS, and practically stripping from the waste down in my back yard. Why, you ask once more? Well, I'll tell you. This. Or perhaps I should say, this guy plus a couple dozen cousins. This one, of course, is a picture I snatched off the Internet but what swarmed me...and yes, what STUNG me, twice! were yellow jackets. I know, because after the one stung me, I looked at him hard while he lay on my sweatpants on my kitchen floor. He was, rather lifeless as that point. 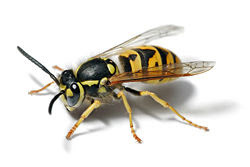 Do yellow jackets die after they sting? Then why, do they choose to do the deed? Excuse me? Yellow Jackets? And where did those suckers come from? I've never seen them in my azalea before now. So after tending two my two stings (baking power paste followed by soap and water followed by hydro-cortisone) one on my thigh and the other on my tummy (yes, he got under my shirt!) I kept my distance and observed these creatures out my kitchen window. I must have really riled them up because they were moving all day long--until the evening started cooling off. Then, I noticed, that they were making a beeline, er, waspline? straight into the center of the azalea and down into the center...like it was the black hole of the Bermuda Triangle or something...then they promptly disappeared. I looked, because my friend Magdalena told me to "look for a hole in the ground" because evidently, that is where yellow jackets nest. I felt no urge to stick my head into the azalea to search for a hole. So, project abandoned. I didn't even move the wheelbarrow until just a few minutes ago. Getting stung was not fun. Not fun indeed. I guess the azalea will stay spiky for the winter. My mom and I had noticed the grass was dead around a rose of sharon that had also died, but we had yet to dig it up. After I mowed, I got out the weedeater and started over near the dead tree/grass. I thought nothing of it when I tapped the weedeater on the ground to let out more string, but I guess the yellow jackets that were hiding in their ground nest did. They probably thought I was knocking at the door, but the swarm greeted me before I knew what was happening. They got me a couple of times on my right ankle, as I was running, screaming, cursing and flailing toward the basement door. I had to dig the one out of the top of my sock cause he got down in there and seemed to be stinging me repeatedly. My mom had me put my foot up and we put fresh cut cucumbers and baking soda on it, but it hurt SO bad. I had to call in to work cause I couldn't stand at a register all night with my ankle swelled up like a softball. When I went back to work, I got a lot of good natured ribbing for it from my boss and other co-workers. Most the time, their ground nest will kill the grass and sometimes the plant they are around. I'm always leary of dry dead patches of grass now. You be extra careful around it! Yellow jackets can sting multiple times. They're bad news. How dare you invade our happy home?! That's what they were thinking as they attacked you. Sigh. yes. I invaded. I didn't know. But they didn't listen. I know they do good things. I think. I don't like to kill them and I guess, I'm glad the little one who bit me didn't die...or, well, I guess he didn't. Not entirely certain. I swept him outside. He seemed rather, lifeless though. Maybe I squashed him a bit. Anyway, Taryn, ouch! your story sounds more awful than mine! My stings itch today. I suppose that means they are healing, huh? Are you kidding?! I hope the little meanie did die!!! How dare he sting you?! Who pays the property taxes, I ask you!! Who makes those mortgage payments to the bank? Those yellow jackets are trespassing, and they should be glad you don't pour gasoline on the entire bush and strike a match!! In fact, they should be bringing you tiny gifts of appreciation for letting them live in your azalea bush.